The University of Applied Sciences and Arts of Southern Switzerland (SUPSI) is pleased to invite you to the Southern Switzerland Innovation Forum. A pooling of opinions between the political, economic and scientific worlds on the theme of innovation viewed and analyzed from three differents perspectives: European, Swiss and Regional. The focus of the three sessions is a reflection about the innovative level and capacity of our region, provided by the participation of prestigious personalities supported by solid examples of innovative firms. 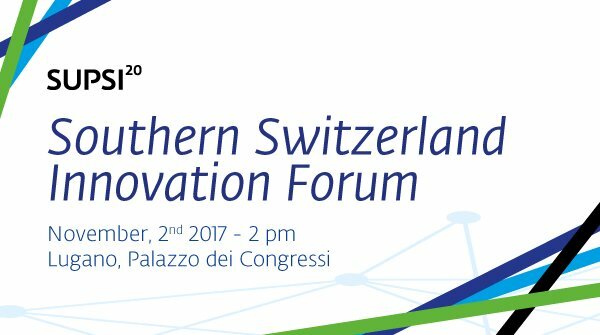 The Forum will be held in English and chaired by Charlotte Geerdink, European Advisor for Innovation of Swisscore and Diego Gilardoni Strategic Advisor and international speaker. 14.00 Welcome by Alberto Petruzzella, SUPSI President. During the three sessions, European, Swiss and Regional visions are compared and discussed to evaluate convergence and divergence of their roles and explain tendencies. Europe: Stefano Fontana, Head of Unit at European Institute of Technology. Switzerland: Gerd Folkers, President of the Swiss Scientific and Innovation Council. Ticino: Giambattista Ravano, SUPSI Deputy Director of research and innovation. the economy and how is this concept practically translated? Europe: Benedikt Bitzi, Head of Google Marketing Solutions for Switzerland and Austria. Switzerland: Monika Rühl, Chairwoman of the Executive Board of economiesuisse. Ticino: Glauco Martinetti, President of the Camera di Commercio; Fabio Regazzi, President of the Associazione Industrie Ticinesi. Does an innovation policy exist? How will it act and interact with Science, Economy and Society? Europe: Robert-Jan Smits, Director General DG RTD European Commission. Switzerland: Johann N. Schneider-Amman, Federal Councillor, Department of Economy, Education and Research. Ticino: Christian Vitta, State Councillor, Director of the Department of Finance and Economics; Marco Borradori, Major of Lugano. Students’ performance of the Accademia Teatro Dimitri, part of a research project supported by the Swiss National Science Foundation. 18.30 Closure by Claudio Boër, SUPSI Vice President.